Health monitoring of civil infrastructure systems has recently emerged as a powerful tool for condition assessment of infrastructure performance. With the widespread use of modern telecommunication technologies, structures could be monitored periodically from a central station located several kilometres away from the field. This remote capability allows immediate damage detection, so that necessary actions are taken to reduce the risk. Optical fiber sensors offer a relatively new technology for monitoring the performance of spatially distributed structures such as pipelines. In this regards, several commercially available strain and temperature sensing equipment such as discrete FBGs (Fibre Bragg Gratings) and fully distributed sensing techniques such as Raman DTS (distributed temperature sensor) and Brillouin Optical Time Domain Reflectometry (BOTDR) typically offer sensing lengths of the order of 100 km’s. Distributed fiber optic sensing offers the ability to measure temperatures and/or strains at thousands of points along a single fiber. 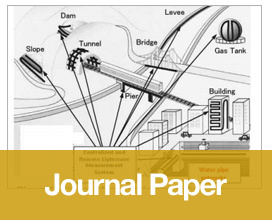 In this paper, the authors will give a brief overview of these optical fiber technologies, outline potential applications of these technologies for geotechnical engineering applications and experience in utilising BOTDR in water pipeline monitoring application.